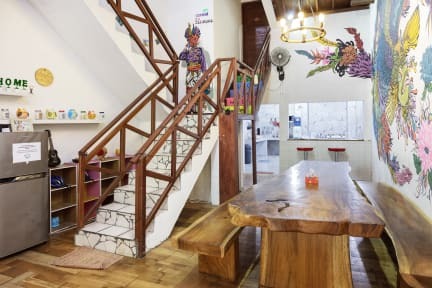 2.Our communal area have 24 hours FREE sugar, tea, coffee, small library, public computer, games, mini gym & sharing kitchen, terrace to chill and You can use our swimming pool in our sister hostel only 15 minutes walking for free. •Only valid until 20th May 2019, after that our room rate will include breakfast. My stay in Ostic House was one of the best stays in Asia. The best hostel I have been too by far. The staff is incredibly nice and helped me when I had a motorbike accident by going to the doctor and carrying my bag and more. Breakfast is also very nice and in walking distance there are some bars and restaurants. Many love and thanks for the staff and hopefully I will return some day. The hostel staff were amazing hosts, seemed to genuinely want to know about any issues you were having so that they could help, whether relating to your stay with them, or another aspect of your trip. They all spoke great English too, which was important in a city which is maybe less geared towards tourists. Thank you so much Putri, Saturday, Nada, Nadya and others, I have already been recommending you! Great hostel, friendly and helpful staff. Located along street with plenty of restaurants and local food stalls, with main attractions in Yogya within easy reach. Would stay again! Solid place, super nice people. The staff are very knowledgable about the city us some good pointers for decent food/places to do. Also their language skills especially English are top notch and there were no issues communicating. Very good stay in this hostel. Clean and nice staff that will help you out with direction and things to do in Jogyakarta and around. I def recommend it. Very friendly and welcoming staff that are always willing to help to make sure you enjoy and maximize your time here. Room was good, the only downside was our private was by the reception, so can get loud at times and the AC didn't work well. I feel so happy with my stay in Ostic House. It's very relaxed chilled atmosphere where you will get the rest you need. The staff are lovely and always ready to help, one of the things I enjoyed was how much they cared for your safety and how easy it was to get I touch with them via WhatsApp so if you were out, you could always reach them. The room I stayed was clean and very spacious, the hostel itself is in a good location. The staff was awesome! Never been in a place with a staff so nice and helpful for all the aspects of my staying. Thank you.